Sig and his family have moved all over the northern part of the world. Always mining and always moving. Always cold. When Sig finds his father, Einar, frozen to death on the lake, he brings him home. Sig waits with his father's corpse while his sister and stepmother go to town to get some help. While they are gone though, Sig is left alone with his thoughts and the corpse. He's not alone long though, when a stranger shows up. This man is huge, frightening and carrying a gun. The stranger says that Einar stole some gold from him and he's here to collect it. Sig doesn't know anything about this gold, their life lives have not been spent wealthy. Sig knows that his father kept a gun in the storeroom though, and if he can get to it he might be able to use it. Sig isn't sure he can use the revolver against the man though, but it's his only hope. So I don't often read "boy books" they don't have the romance that I find so keen. This was a very interesting tale though and I'm glad I read it. This didn't have as much action in it as one might imagine, nor was it really a story of wilderness survival. When I had seen it compared to Paulsen and Jack London novels, I expected more of a Hatchet type of book. This was a story of survival, but of a more menacing kind. The elements are tricky, but not as tricky as a stranger with a gun. 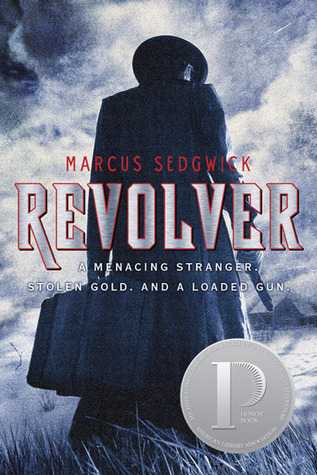 I loved the historic quotes about guns interspersed throughout the novel. I loved that it was historical fiction too. The story jumped between a couple time periods, to give you a well-rounded tale that tells you all the sides. Sig was a very enjoyable character, and I loved reading about his mind at work. I also learned the details of how a gun works from this book, I never knew the specifics, and it was very interesting to finally learn. I think this will be a great novel to hand boys who love reading. It might not be a great reluctant reader pick, simply because there is not a lot of action. This book was very well-written and had me holding my breath at times. I will have to check out more by Marcus Sedgwick soon. "Even the dead tell stories." "Lying in the middle of the pool of blood was Anna's doll." I'm not sure if this is something I'd pick up and read, but it sounds like a good boy book. It has a very creepy cover too and it sounds like the cover goes well with the story.